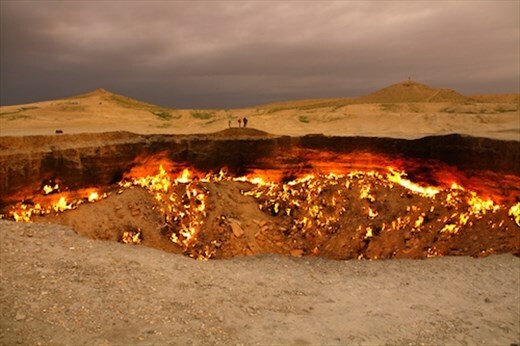 Gas crater Darvaza is located in Karakum desert, in the north-west of Turkmenistan. The diameter of the crater - 60 meters, depth - 20 meters. 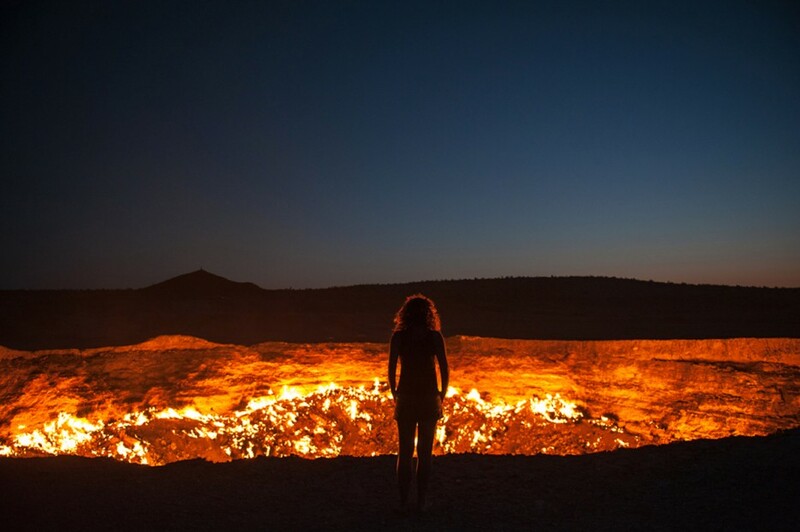 Local people call it “The door to Hell” or “Gate of Hell”. The accumulation of underground gas was discovered by the Soviet scientists in the village Darwaza in 1971. During the excavations, geologists found an underground cavern (empty), because of it the land failed and there was a large abyss filled with gas. It was decided to set fire in order to avoid harmful gas for human and animals. Accordance to the hypothesis of geologists, the fire had to go out in a few days, strangely enough, but they were wrong. Since then natural gas has been burning without ceasing. Thousand of insects come here to the light and heat, but they are doomed. The distance to nearest village Erbent is 90 kilometre. Arriving in this amazing place in the early morning, you can enjoy the beautiful spectacle of desert illuminated by a bright light and burning crater surrounded by orange light. There are two craters if similar origin not far from the crater Darwaza, however, the pressure of the gas is not as strong, so they do not burn. One of these craters is filled with liquid of brightcolor, the bottom of the other - light gray.